UFO research began over 2000 years ago according to popular literature, but the age of the Volvo miniature can be said to date from 1930 when the first toy model of a Volvo lorry appeared in a catalogue. There are only a few Volvo lodges (groups) which are involved in tracing all hitherto unknown Volvo models and which would also like to own them. Is there a specialist name for a collector of Volvo miniatures? A stamp collector is called a philatelist etc. but there is no truly correct name for a Volvo collector. Famous collectors Francis Juriens (Swiss) who has the biggest collection of approximately 4,500 models, Carlo Schmidt and Ernst Kastefijn from Holland, Satoshi Nakano from Japan and last but not least Notker Hilbrenner and The German Volvo Club. These all have one thing in common, the love of Volvo model cars and the constant thirst for more discoveries at flea markets and junk shops. I shall discuss in this piece only the rarest models of the many which have been found since 1930, those which are rare because of their age and because only a few were made. I shall deal only now with models dating either from immediately before and after the war. Firstly the Volvo PV4 (1929 version) also known as the "SETO" chiefly in Scandanavia. 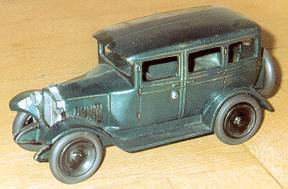 A cast iron model - precise detail - scale 1:23 2 sections - cast in Germany - bodywork dark green, an occasional example of this model appears at a toy auction and will fetch a four figure sum (German marks) In the mid 1930's a smaller model appeared - scale 1:43 - PV36 -CARIOCA - Swedish manufacturer - tin plate, enjoyed a revival in the 1980's when a junk dealer rediscovered the original moulds in the old factory, some new models were then cast, an unusual occurrence, but very lucky for Volvo collectors. 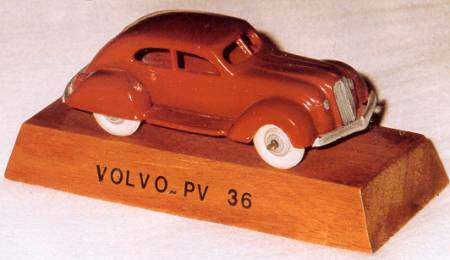 BRIO was the big name in Sweden after the war, Volvo entrusted them with the first commercial model of the PV444, which appeared first in 1944 but actually went into production in 1947. Chiefly black, white and red, most were given to Volvo dealers to give to Volvo customers buying the actual car. One such miniature turned up after the death of a PV444 driver who had lovingly cherished both cars for 45 years. This was a tin model in perfect condition fetching possibly DM 2500 on the collectors market. 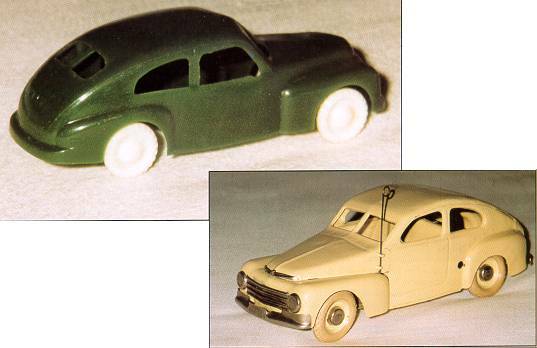 Wooden models appeared in the 1950's made by BRIO, in fact the first one appeared in the BRIO catalogue as early as 1948 (No S 335) in red, yellow and black - finely detailed - completely wooden bodywork, headlights etc - chrome hub caps on wooden wheels. 1952 the PV445 appeared, very rare and seldom found now. 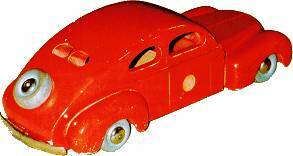 Another Swedish toy manufacturer produced wooden models at this time, the 'TOY' was 31 cm long - American styling, very similar to the BRIO model appeared in catalogues in 1947/48, so very rare to come by. The first smaller basic model of the PV444 appeared around 1950 in Denmark, 11.5cm - red - aluminium finish. Principally a toy, but very attractive. An even cheaper and more basic model was the CERBO model which flooded the Scandinavian market from 1949 in various colours. CERBO was the first manufacturer of a plastic Volvo model which was very successful, 500,000 were produced in one year and the advertising of which was backed by Volvo. However few of these remain as the material used has not stood the test of time. The plastic was very brittle and thin. Despite the drop in value for a collector, this model is still a popular toy where it has survived. 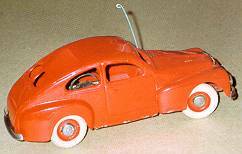 My next report will deal with the Volvo collectors dream - a PV444 as a pedal car.